In March 2013, FIFA published a list of 52 prospective referees, each paired, on the basis of nationality, with two assistant referees, from all six football confederations for the tournament. On 14 January 2014, the FIFA Referees Committee appointed 25 referee trios and eight support duos representing 43 countries for the tournament. Yuichi Nishimura from Japan acted as referee in the opening match whereas Nicola Rizzoli from Italy acted as referee in the final. ^ Agence France-Presse (1 July 2014). "World Cup 2014: Belgium Beat USA to Set Up Quarterfinal Clash vs Argentina". NDTVSports.com. ^ "Castrol Index: Full ranking". FIFA.com. Archived from the original on 12 July 2014. ^ a b "World Cup money pot increased to $576m". reuters.com. 5 December 2013. Retrieved 25 April 2014. ^ "2014 FIFA World Cup Brazil Technical Report and Statistics" (PDF). FIFA.com. 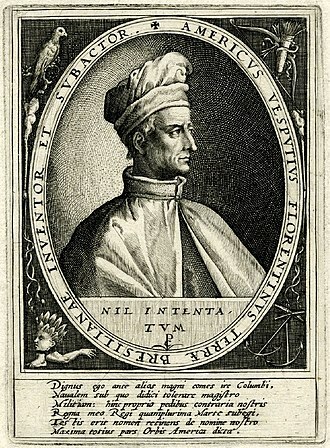 p. 151. ^ "World Cup set to be most lucrative ever". ESPN FC. 23 May 2014. ^ Dunbar, Graham (22 May 2014). "Record World Cup numbers game for FIFA, Brazil". USA Today. ^ "FIFA's Inspection Report" (PDF). Retrieved 9 October 2011. ^ "Corruption to blame for some Brazil World Cup cost rises". Bloomberg. 23 May 2014. ^ "Brazil World Cup stadiums on track, but costs soar". Reuters. 3 April 2012. ^ "2014 Fifa World Cup: Where are the 12 host stadiums in Brazil?". BBC Sport. British Broadcasting Corporation. 3 December 2013. ^ "FIFA World Cup 2014 host cities to receive US$ 1.5 billion". Brazil-Arab News Agency. 22 July 2009. Archived from the original on 1 July 2014. Retrieved 18 November 2009. 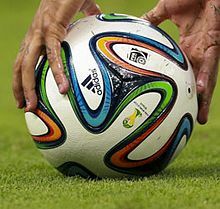 ^ "Less than half of Brazilians favor hosting World Cup, poll shows". Reuters. 8 April 2014. ^ "The social cost of Brazil hosting World Cup 2014". Bleacher Report. 6 June 2013. ^ "Fifa concern about three Brazil stadiums". BBC Sport. British Broadcasting Corporation. 30 May 2014. ^ "Brazil boosts World Cup security budget as crime rises". CNN. 5 December 2013. ^ "EA Announces EA SPORTS 2014 FIFA World Cup Brazil". IGN. 6 February 2014. Retrieved 24 February 2014. ^ "Brazilian star Claudia Leitte to perform with Pitbull and Jennifer Lopez on the official song for the 2014 FIFA World Cup". FIFA.com. 23 January 2014. ^ Drum, Bruce. "Lufthansa to rename 8 aircraft "Fanhansa" for the 2014 FIFA World Cup". Retrieved 15 July 2014. ^ "2014 FIFA World Cup Brazil official partners". FIFA.com. Retrieved 12 January 2014. ^ "Host Broadcasting". FIFA.com. Retrieved 4 December 2013. 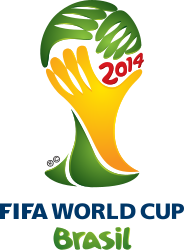 ^ "Sony Professional awarded 2014 FIFA World Cup Broadcast Production Contract". Live-production.tv. 13 September 2012. ^ a b "Sony's astonishing World Cup statistics". RedShark News. 22 May 2014. ^ "Sony and FIFA announce further 4K coverage of the 2014 FIFA World Cup". FIFA.com. 3 April 2014. ^ "2014 FIFA World Cup Brazil™ Media Rights Licensees" (PDF). FIFA.com. 7 November 2013. ^ "FIFA revenue estimated to be 4 billion dollars at the close of the 2014 World Cup". CONMEBOL.com. 17 May 2013. ^ "International Broadcast Centre to be hosted in Rio de Janeiro". FIFA.com. 27 May 2011. ^ "Nerve centre for World Cup TV production opens in Rio". FIFA.com. 2 June 2014. ^ "WM: Die Top-10-Quoten aller Zeiten im deutschen Fernsehen". Focus Online (in German). 14 July 2014. Retrieved 14 July 2014. ^ "USA vs. Portugal World Cup Match Most Watched Soccer Game In U.S. History". Fox News. 24 June 2014. Retrieved 27 June 2014. ^ "2014 FIFA World Cup™ reached 3.2 billion viewers, one billion watched final". FIFA.com. 16 December 2015. 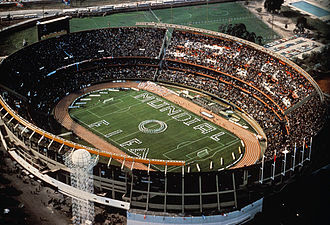 ^ "Factbox: Timeline of deaths, accidents at Brazil's World Cup stadiums". Reuters. 15 February 2014. Retrieved 29 June 2014. ^ "Brazil World Cup: seventh worker dies on stadium construction". Guardian (UK). Associated Press. 29 March 2014. Retrieved 29 June 2014. ^ Davies, Wyre (9 May 2014). "Brazil World Cup 2014: Eighth death at football stadiums". BBC News. British Broadcasting Corporation. Retrieved 29 June 2014. ^ Downie, Andrew (25 October 2013). "Soccer-Cuiaba fire adds to Brazil's World Cup woes". Yahoo Sports. Reuters. Retrieved 29 June 2014. ^ "Fatal accident on flagship Sao Paulo monorail". BBC News. 9 June 2014. Archived from the original on 4 July 2014. Retrieved 5 July 2014. ^ Gibson, Owen & Watts, Jonathan (5 December 2013). World Cup: Rio favelas being 'socially cleansed' in runup to sporting events. Guardian. Retrieved on 3 March 2015. ^ Phillips, Tom (26 April 2011). Rio World Cup demolitions leave favela families trapped in ghost town. The Guardian. Retrieved on 3 March 2015. ^ Hodges, Elena (21 June 2014). The World Cup Is Underway. What Has Become of Favela do Metrô?. Rio On Watch. Retrieved on 3 March 2015. ^ "Brazil Beats Japan, Protests Spoil Confederations Cup Opening Day". Voice of America. 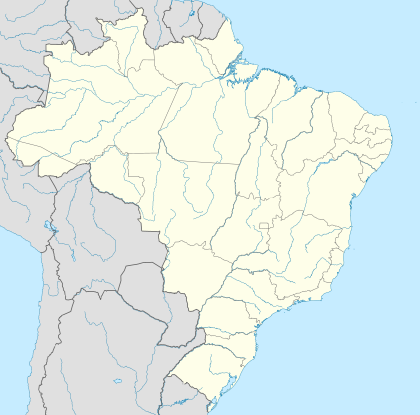 Brasilia: Federal government of the United States. 15 June 2013. Retrieved 16 June 2013. ^ "Fifa scraps speeches to avoid protest". BBC Sport. British Broadcasting Corporation. 12 March 2014. ^ "Confed Cup protests continue". ESPN. 17 June 2013. ^ "Police clashes at start of Brazil Confederations Cup final". BBC Sport. British Broadcasting Corporation. 1 July 2013. ^ "Strikes, violent protests hit Brazil ahead of World Cup". CNN. 16 May 2014. ^ "17 Pictures Of Shocking Violence As Police 'Open Live Fire' On Anti-Fifa Protesters". Huffington Post. 16 June 2014. ^ "Brazilian police fire tear gas at World Cup protesters; CNN employees injured by anti-riot weapons". CNN. 12 June 2014. ^ Wilson, Jonathan (18 June 2014). "World Cup 2014: Chile fans invade Maracanã before Spain game". The Guardian. ^ "World Cup Chile Fans Storm Rio Stadium And 85 Detained". Bloomberg. 19 June 2014. ^ "Flyover collapses in Brazil World Cup host city". BBC News. 4 July 2014. Archived from the original on 5 July 2014. Retrieved 4 July 2014. ^ Cawthorne, Andrew (3 July 2014). "Overpass collapses in World Cup city, crushes vehicles". Reuters. Archived from the original on 5 July 2014. Retrieved 4 July 2014. ^ Decent, Tom (20 June 2014). "Alvaro Pereira, knocked out then raring to go". The Sydney Morning Herald. ^ "Kramer head injury revives concussion concern". Sports Illustrated. 13 July 2014. Retrieved 6 January 2019. ^ "Referee: Christoph Kramer didn't know it was World Cup final after head blow". Sports Illustrated. 17 July 2014. Retrieved 6 January 2019. The 2013 FIFA Confederations Cup was the ninth FIFA Confederations Cup, which was held in Brazil from 15 June to 30 June 2013 as a prelude to the 2014 FIFA World Cup. Host nation, Brazil successfully defended their title with a 3–0 win over Spain in the final and it was their fourth Confederations Cup title and third in a row, after previous wins in 1997,2005 and 2009. According to FIFA president Sepp Blatter, the 2013 FIFA Confederations Cup was the best version of the tournament ever played, the competition was the first national team tournament to employ goal-line technology, which was used at the 2014 World Cup. 1Note, Italy was awarded a spot in the competition because Spain had won both the 2010 FIFA World Cup and UEFA Euro 2012, since both competitions award their winners a place in the FIFA Confederations Cup, the runner-up of UEFA Euro 2012 received an invitation to the tournament. 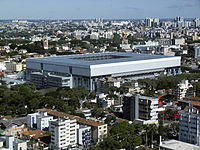 Six stadiums were used, each in a different city, the draw for the competition was held at the Palácio das Convenções in the Anhembi Convention Center in São Paulo, Brazil on 1 December 2012. Teams from the confederation were not drawn into the same group, therefore one team each from UEFA. 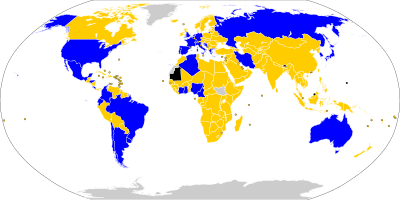 Brazil and Spain had automatically been assigned as A1 and B1 respectively, therefore Italy and Uruguay were assigned respectively to Group A, ten trios of officials were announced by FIFA on 13 May 2013. Teams had to name a 23-man squad by the FIFA deadline of 3 June 2013, the squads were announced by FIFA on 7 June 2013. The competitions dates were confirmed by FIFA on 27 July 2011 in the build-up to the draw for the 2014 World Cups preliminary qualification rounds. As the competition partially overlapped with the round of the 2014 FIFA World Cup qualification in Asian zone. However, the AFC decided that the day would only be adjusted for the AFC representative at the Confederations Cup. The official final schedule was presented in Rio de Janeiro on 30 May 2012, all times listed are Brasília official time. All eight teams entered the group stage, the group winners and runners-up advanced to the semi-finals, while the bottom two teams in each group were eliminated from the tournament. Vanishing spray, known as vanishing foam, is a substance applied to an association football pitch in order to provide a temporary visual marker. Its use in football is not regulated by the Laws of the Game, authorisation being in the hands of the body of a match, league. Vanishing spray is applied from an aerosol can carried by the referee in a holster secured to their shorts. The referee has full discretion on whether or not to use vanishing spray and it is generally only used when a free kick is awarded where a goal-scoring attempt is highly likely to develop. When the referee chooses to use vanishing spray, he or she will usually mark the spot of the ball, pace 10 yards in the direction of the attack, the referee will indicate for the free kick to be taken, usually by blowing the whistle. The marks disappear after one minute. The can contains water, butane gas and other ingredients including vegetable oil, the liquefied butane expands when the product is ejected from the can. The butane evaporates instantly, forming bubbles of gas in the water/surfactant mixture, the surfactant cause the bubbles to have stability and hence a gas-in-liquid colloid forms. The bubbles eventually collapse and the foam disappears, leaving only water, more technical details can be found in the US patent applications for two of the commercial products available, Spuni and 9-15. In 2000, Brazilian inventor Heine Allemagne developed the spray under the name Spuni and its first use in a professional level was in the 2001 Brazilian Championship, Copa João Havelange. Referees unanimously approved its use and the spray was since adopted in Brazilian competitions, an international patent application for Spuni was filed by its inventor on March 31,2000 and the patent granted on October 29,2002. Since then, the spray has been used in international football competitions. In June 2014 the sprays latest commercial version, 9-15, made its debut in the FIFA2014 World Cup, 9-15 was developed by Argentinian entrepreneur Pablo Silva and its commercial production started in 2008. The 2011 Copa América tournament was the first tournament for teams to use the spray. Its success caused it to be adopted by several leagues in 2011 in America.